The Prospect Heights Historic District, subject of a hearing last October, has been OK'd by the Landmarks Preservation Commission, the largest landmark district created since 1990. The map below is courtesy of photographer Tracy Collins. Note how two fingers of row houses would bookend the southeast block of the Atlantic Yards site, slated to be a staging area for arena construction, and also a massive parking lot for workers and visitors, ultimately with 2070 spaces. 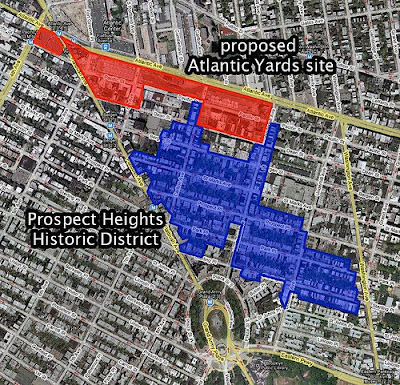 The Atlantic Yards site, according to the Empire State Development Corporation, is blighted. I wonder how many blighted areas are abutted by historic districts. NoLandGrab's Eric McClure points to the loss of the Ward Bakery--mention of which unsettled the LPC last October--on that southeast block, and the role of the Municipal Art Society of New York (MAS) and the Prospect Heights Neighborhood Development Council (PHNDC) in advocating for the historic district. NoLandGrab: While MAS and PHNDC are to be commended for their efforts, had the two groups been more vociferous in their opposition to Atlantic Yards — both are members of the "mend-it-don't-end-it" BrooklynSpeaks coalition — one has to wonder if the Ward Bakery, too, could have been saved from Bruce Ratner's wrecking ball.